Paradise for one! A burst of colors and flavors including mango wedges, juicy kiwi slices, half of the fresh strawberries hand dipped in gourmet chocolate, grapes, cantaloupe, pineapple daisies and fresh banana slices hand dipped in a combination of white and dark chocolate all arranged in a keepsake Edible Arrangements mug. This juicy treat is only available for a limited time, so treat yourself or say get well, I’m thinking of you or thanks a bunch to that special someone! 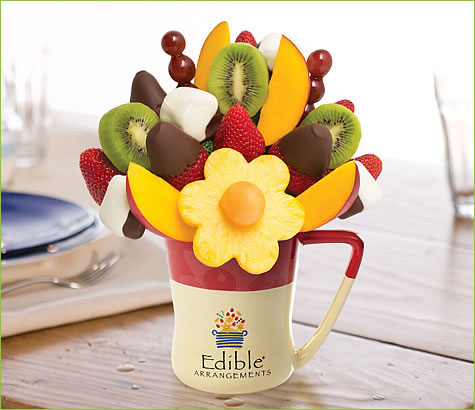 Bouquet will be arranged in a ceramic container or keepsake Edible Arrangements mug (shown). Container and color may vary.